Today I share someone else’s story. A story about the never-ending love when you are a Daddy’s girl – forever. Thank you my sweet cousin for sharing your story. He was so very special to me also. I will never forget this day. It was the day before Daddy died and he asked to go out and sit on the front porch for a while. This was also my birthday, and yes, Dad went to be with Jesus the day after my birthday. I remember being so upset knowing it wouldn’t be long and that I didn’t want my Daddy leaving me on my birthday. I believe with all of my heart that he found the strength to somehow hold on just one more day…… just for me. The first strange thing that happened that day was that he was sitting in a chair right beside the front door on the porch. It was as far as he could make it and I was on the other end of the porch in the swing. He looked at me and said, “Now how old are you today Sissy?” I said, “I’m 35” but in my mind that day, at that moment, I felt like I was five again. I was Daddy’s little girl. Most would think this was strange but for Daddy, it wasn’t. He could never remember any of his kids’ birthdays. Mommy would always have to remind him, although I knew that no one mentioned it to him, because we didn’t want him to worry about it. Whenever Mommy would tell him it was our birthday? He would always try to make it special. We all knew he was too sick to make this one special – or so we thought. He ended up making my last birthday with him the most memorable and special birthday of all. To keep Daddy from seeing me cry, I stepped out into the yard like I was playing with my dog, Harley, at least until I can get myself straightened up. I looked up at Daddy just sitting there enjoying the outside that day. Even though it was June 25th, it was a very nice day. It wasn’t too hot and it wasn’t too cold, it was just a perfect day. During this time, I noticed a beautiful butterfly flying around Daddy. It was purple and yellow (purple is my favorite color). It was the prettiest butterfly I had ever seen. I don’t think he even noticed it but I remember thinking of the tale about what it means if a butterfly lands on you somewhere? like your shoe or whatever? you would be getting a new pair of shoes! So I kept watching this butterfly to see where it was going to land. It just kept circling around Daddy. I remember thinking – “he doesn’t need anything new, because I knew he wouldn’t be here much longer, so why would he need anything?” I knew this sounded silly, and I was even thinking it the whole time it was going through my mind. Just then, the butterfly landed right on daddy’s head! It seemed like it was there forever. It was then that God spoke to me and said your Daddy is going to have a brand new body. No pain, no more tears – he will be made “brand new.” The feeling that came over me was such a peace that mere words could never describe. 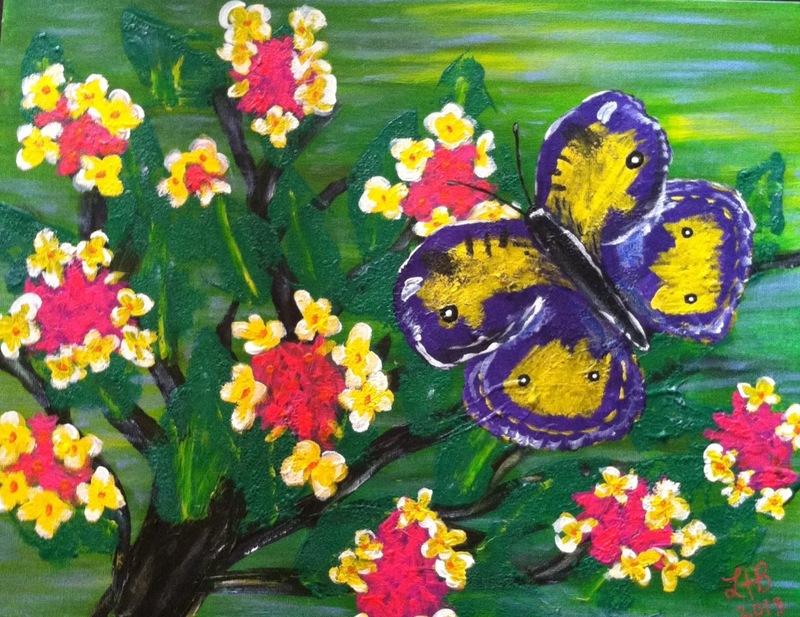 It is the very reason that I love butterflies, they will always be special to me. A reminder…. that God makes all things new. 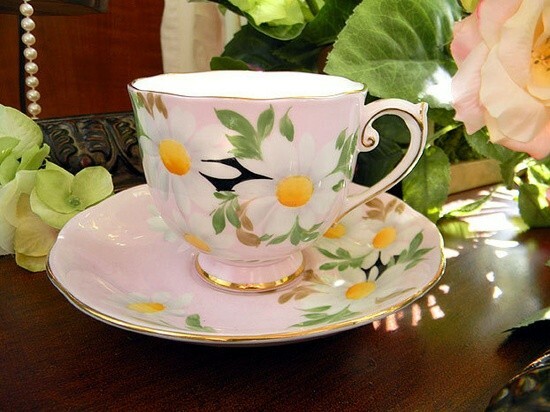 I love to share great stories with you! I especially love it when God directs us to share and then to share again. And I especially love to be a part of great surprises!!! I wasn’t all that excited to go back to a full-time job. Although it was at my daughter’s private school and I knew most of the staff, it would be a different role for me, assisting the Kindergarten teacher. If I had known earlier the things I would learn from this group of energetic five-year olds? no doubt, I would have enlisted sooner. The teacher was new at the school, but I would learn early on that we were a great team. She continues to be one of my dearest friends. We learned a lot together that short year. I think we learned more about ourselves through this particular class than we could have imagined. I am thankful every day for that opportunity. I first learned that five-year olds are still pretty much babies…but DON’T call them one. It was hard for me not to refer to them as such, since I still referred to my then third-grader as my baby. You can rest assured that I was corrected by the little people more than once. Maybe, this is the reason that my teacher friend referred all instances such as boo-boo’s, snotty noses, and separation anxieties to my desk. (I’m giggling). She knew I was an over-nurturer and what we often referred to me as “the softie”. I, in turn, referred to her the disciplinarian, rule enforcing, and leadership roles. Yes, we had a great system…and we worked really well together. She was always cold, and I was always hot..but we made it work with short sleeves for me and a constant sweater nearby for her. (I know she is laughing reading this). This year would be a rollercoaster ride for us, but in a fun sense. The days were never ever boring, filled with some surprises we had never expected. We originally had 22 students enrolled, all with 22 different personalities. We had criers, bathroom enablers, comedians and well, what comes to mind mostly? was a whole lot of needy little people with hearts the size of Mt. Everest. Some days it was parallel to adults..just in miniature bodies. We embraced them and learned from them on a daily basis, or at least being new to assisting, I certainly did. As quickly as it started on the first day, the year flew by. The days were long at times, but the year seemed to zoom. I can’t tell you how rewarding it was to watch the little sponges soak up every tidbit of new information. For these children, everyday was a new adventure and we watched them develop what they had learned. I can’t write this blog without mention of the adult things I learned, and what our class learned as a whole. Ours was a little more special. I truly believe that we are placed in certain circles for a season. Our class endured a season that caused growth beyond their young hearts. One of “our” children in the class battled a rare form of childhood cancer. We managed to make our class as normal as possible. It was important for all of them. Some days were very difficult, but nothing could have prepared us for that particular year. We never really knew how much time we would have with this bright-eyed little girl, but we were determined as a class, to make the most possible out of it. I don’t really know who the encourager was here, she seemed to be ours on most days. Innocent and full of giggles, I will never doubt that she was there to teach us about my favorite word “Tikvah” (Teek-vah) meaning: HOPE. I learned that I had more hope when I had conversations with her. I had more strength, after all, if she could manage being so sick with a continuous smile? what a wimp I would have been to do anything less. I learned to have courage in her presence, even though I would take my break and cry silently in the lady’s room, or during their nap time. It was very difficult, but we learned to be strong for her, making sure she never doubted that we were there for her. Out of the many conversations I had with her, I think this one I have never let go. During our lunchtime, she crawled up into my lap and told me that her stomach hurt, and that she didn’t want to eat that day. I said, “can’t you just try to eat a little something?’ her reply to me was this..”It’s really okay Mrs. McCoy, do you know that when I go to heaven soon, I will eat whatever I want because my tummy will be all better.” It wasn’t a question, it was a profound statement from a child that new where her HOPE was. She knew the meaning of (Tikvah) I choked back as best I could and said, “what will be the thing you will want to eat most?” she giggled and said “Chocolate Cake!” Needless to say, the child was given chocolate cake at every request from that day forward. It was a heart moment for me, taught by a five-year old. There were many other memories from that year. I was given the task of teaching about bugs.. creatures great and small, since they creeped out my co-worker. I was the “bug” lady. I drove a bug, I actually liked bugs, and I have almost 20 pictures of bugs that were drawn for me in crayon and markers by this class. Looking at a spider under the microscope proved to be one of our best days. A roomful of squealing girls and boys, who knew a spider had so many eyes!!!!! Our year came to a close, and our classroom angel made her flight around Christmas. We grew together. We continued our journey of learning together. It was hard, but I will always think this class learned what most their ages had not. They learned love and loss much too early, but they also learned compassion for one another. 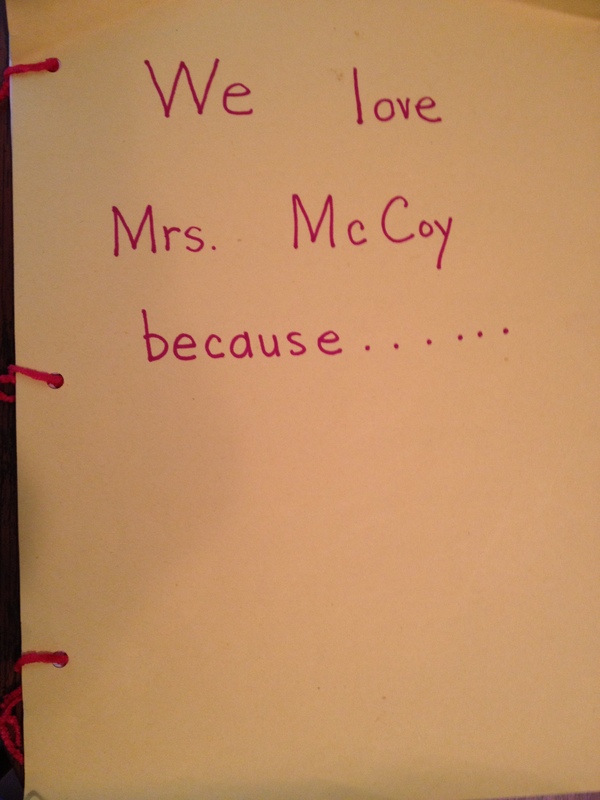 My teacher friend had them to make me a special book entitled “Why We Love Mrs. McCoy” that year, it summed up my entire years’ experience. I found it today in some school papers, it still makes me smile. 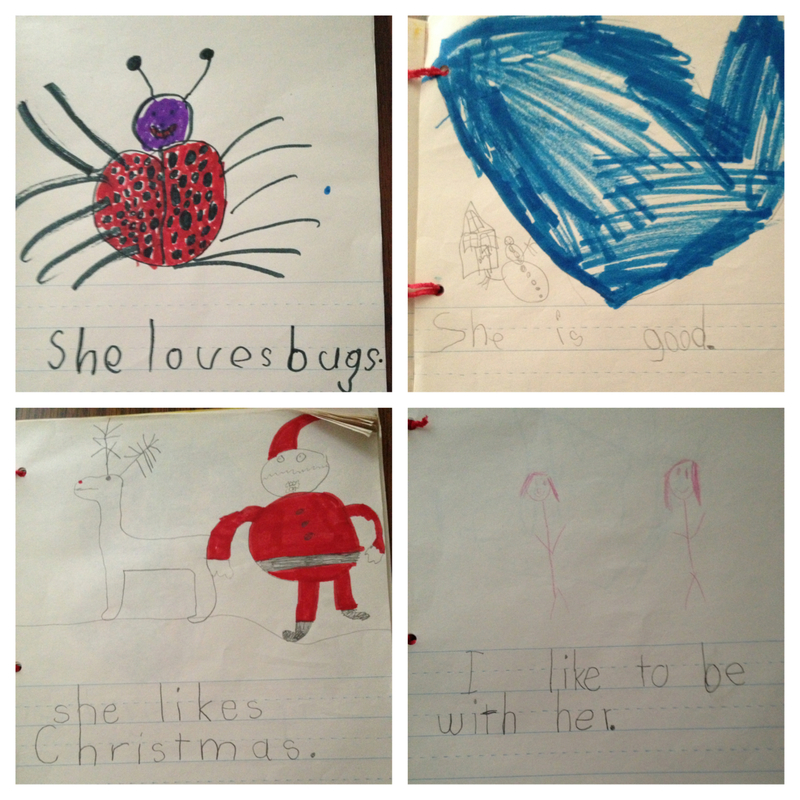 Somewhere in the corner of my soul, I realized that I had put a small mark on them in their little world, even if it was about bugs and my love for Christmas. Insignificant, as it was, it was more of the mark they left on me as a person. My prayer is that you never take for granted the print you leave on the hearts of children. Teach them well, but more importantly, learn from them. Great or small, make your impact an encouraging one, one of Tikvah- HOPE.